Ulcers are basically the loss of the outer layer of the lining of the mouth exposing the next unprotected layer. This protective layer that is removed is called the mucous membrane. This layer is continually turning over. The cells are created at the base of the membrane at the junction of the next layer. They are then pushed to the surface as more cells are created underneath. As the cell reaches the surface it degrades and eventually falls out of the body (exfoliates). This is important in areas of constant abrasion. It provides a protective layer to the body underneath to keep out pathogens such as bacteria and prevents loss of fluids. In the mouth its “skin” is different to outside the mouth, e.g. on the face, as it needs to be kept moist with bodily secretions (saliva). It lacks a substance called keratin that contains proteins that prevents it drying out. Some areas of the mouth contain some of this substance where there is greater abrasion areas such as the hard palate, gums attached to the bone around the teeth (attached gingiva), and the dorsum (top) of the tongue. The tongue also has specialised mucosa called taste buds. Trauma – common examples include cheek biting, denture rubbing, sharp or broken teeth or burns from hot foods. Chemical – a classic cause is chewing a aspirin tablet for pain relief. It’s meant to be swallowed. Its chemical name is acetyl salicylic acid. So in the mouth it’s an acid and chemically “burns” the mucosa. Viral – such as cold sores caused by the herpes simplex virus type 1. This is usually can be found on the lip but can be found in the mouth. Chicken pox. Minor recurrent apthous ulcers – are up to 10mm in diameter. Are unknown in origin which tends to clear up within 2 weeks without scarring. 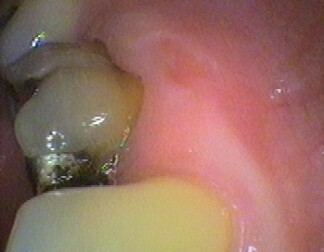 Major recurrent apthous ulcers – this variety causes scarring and is usually greater than 10mm diameter. Biochemical – low Iron levels and Vitamin B12 and folic acid and Vitamin C have a role in the cell turnover and can cause reduced resistance to constant abrasion. Genetics – sometimes it runs in families. Hormonal factors – such as in women before periods or after menopause. Oral Cancer – typically a non healing ulcer that becomes firm and attached to the underlying tissue. Medications – for example nicorandil, anti-inflammatories, and nicotine replacement therapy, bisphosphonates (used for osteoporosis). Chronic Diseases – such as Crohn’s disease, coeliac disease, HIV infection, and Behçet’s disease, lichen planus. Bacterial infection – including tuberculosis and syphilis. Dry mouth – reduces the lubrication of the surface. The pain associated with an ulcer occurs with the exposure of the underlying layer known as the epidermis and the next layer the dermis. The pain stops once the outer epithelium has grown back to cover the exposed underlying layer. Treatments are aimed to reduce inflammation and to prevent bacteria taking advantage of the loss of the protective layer to invade the body. Each type of ulcer has a specific treatment and vigilance to ensure the underlying cause has been dealt with. Next week – Treatment of ulcers and follow up!